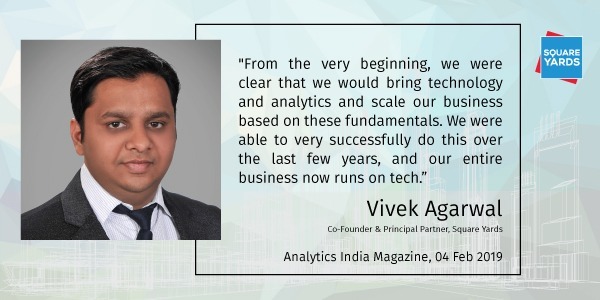 Analytics India has carried a feature about how Square Yards has used analytics and technology for its growth. It featured online on 4th February 2019. “It has brought standardization in our processes, in the way we generate leads, manage leads and nurture leads, and in how we meet the clients. It has helped us reach a wider target audience, and scale our processes. So earlier, we used to reach 1,000 people in a day, with the use of technology we are able to reach hundreds of thousands in a day.” – Vivek Agarwal, Co-Founder & Principal Partner, Square Yards was quoted in the feature. News Hour also has carried a story on the same theme. Read it here.